Place a large pot over medium heat. Add oil to pot. Once the oil is hot, add diced onions, carrots, and celery to the pot. Stir. Saute over medium heat for 10-15 minutes, stirring occasionally, until the onions are translucent and the carrots are softened. Add the dried white beans, garlic, bay leaf, dried oregano & basil to the pot. Stir and cook for another 3-4 minutes. Add the ham hock, diced ham, parsley and rosemary sprig to the pot. Cover the ingredients with about 8 cups of water. Add 1 tsp kosher salt and 1/2 tsp freshly cracked black pepper. Stir. Raise heat to high and bring soup to a boil. Once you reach a boil, reduce heat to medium low. Simmer soup over medium low heat for 2 - 2 1/2 hours until the beans are tender. If soup starts to get too thick, add a bit more water. Once beans are soft, remove the ham hock and rosemary sprig. Taste then season as necessary with kosher salt and freshly cracked black pepper. Soup can be made a day in advance and refrigerated until ready to serve. Serve hot with hot sauce on the side for those who like it (ME!). Enjoy! YAY! So pleased to see you appear in my reader! Soups such as this are perfect comfort food and I’m super happy you added beans and not barley…barley is just pure evil…love ’em beans though!! This one looks just fantastic. One of my favorite winter comfort dishes. I’m soooo waiting for soup weather around here. If we wait until about 8:00 to eat, it’s just cool enough to imagine fall. Thanks for a great soup idea! thanks bron! it’s been far too long since we last did a real post on wwe! i might have to fight ya over the barley thing though! 😉 Beans work here, but i do like barley…. in the right situations! thank kalyn! me too. 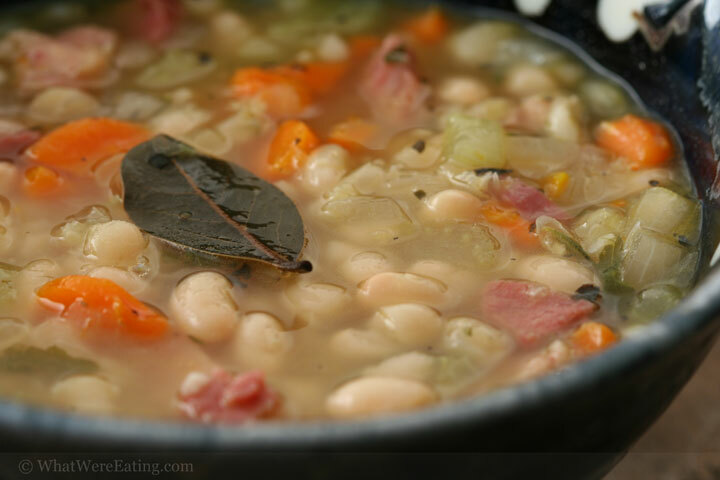 what is it about smokey ham hocks that go so well with beans? if we didn’t have to produce new content for websites i could see me eating stuff like this every week! i agree, recipegirl! we just pretend that it’s actually soup weather. I was under the weather when i made this so i think the slight fever made it more bearable. when does it cool down in san diego again? December? Yum! Is this the soup you’ve been saving for me?? I hope so! Looks awesome! I also have a couple of ham hocks in the freezer waiting to jump into a big pot of beans. Just wish the stupid weather would cooperate! Just curious – why kosher salt if you’re using ham? Or does ‘kosher salt’ mean something different? Yay! Welcome back, y’all. Shots all around, and what the hell, lets break out the bacon too. I made a roseary mint pesto, turned out pretty good, infused oil with rosemary so it wouldn’t be so woody, used it on salmon, and poaching it in tea might be pretty damn good. Gonna try making crawfish pumpkin ravioli with brandied lobster broth, maybe use bit of slab bacon in the pumpkin/crawfish, or use tarragon, or both, pant pecan’s mokey stuff so I don’t have to use a huge amount of it. The computer at work has a sucky sticky keyboard. oh goody! a new post…the soup sounds perfect for the chilly PA weather over here. i love ham and bean soup. well done. I made this soup! It’s classic! Great for Thanksgiving! Hey guys – greetings from a fellow foodie! Love your site, love your food savvy and love your creativity. Found you while searching out the perfect thing to do with my giant left over ham bone from t-day. Your recipe sounds likes perfection – can’t wait to try and and look forward to peering into your kitchen in the future…..
Amanda, Once again a hit! I just made the Mac and Cheese again the other day and while back here looking over your recipes, I decided to give these a try (even though in low 90°s here. Toooo good. Ok – might seem like a silly question but I don’t do a lot of cooking with dried beans. The recipe says “1lb of dried beans, rinsed and picked through.” Do I assume I need to soak them first? I just want to make sure so I can get it right the first time. Thanks! I am making this soup today. Since I did not have white beans and live too far from a store to make a trip just for beans, I am using a pound of pinto beans and adding some Jalapeno, with a pinch of brown sugar to the mix. Yummy! The weather is turning quick and I plan on freezing most of the batch.